Reflections of a Grady Doctor: This little light of mine. "This little light of mine, I'm gonna let it shine. . ."
I was working in the clinic the other day with one of my favorite medicine nerds, Lorenzo D., which is something I always love to do. Mostly because, without fail, I learn something new when we work together. It embarrasses him when I talk about how frighteningly smart he is and how densely packed his brain must be with facts and figures. But seriously? It's true. I could tell all sorts of stories about Lorenzo D. and his ridiculous medical brain, but I won't because he'd be mortified. Nope. I won't tell you about the day that he was running the residents' favorite case conference where they try to stump the professor and how he went off into a crazy ten minute tirade on the inner workings of the clotting cascade and fibrin cross linking. I mean, I certainly wouldn't dare share anything about how, literally, all of the residents' mouths dropped open at the sheer complexity of the bombs he was dropping off of the top of his noggin like it was NOTHING. Nor will I admit to sending him a text message somewhere during that whole soliloquy that said, "Dude. You're a BEAST." Naaah. That would totally embarrass him, so I won't do any of that. I love it when I see someone putting their best foot forward when it comes to medicine. I think it conveys caring, don't you? When someone looks at your actions and they can tell your heart is in something that's a good thing. The Grady elders would call that "letting your light shine." I like to think that a lot of my fellow Grady doctors do that every day. On this day, I was talking to a resident who was seeing a patient that he thought might have sinusitis. He flashed a light from the otoscope onto the sinuses and looked through the floor of the patient's mouth for light to shine through. This process, called transillumination, helps with making a diagnosis of sinusitis--if you don't see the light passing through what should be air-filled spaces, chances are it's clogged with mucous or some kind of goom-bah consistent with a sinus infection. "It didn't transilluminate when I shined a light." That's what the resident said to me and I simply said, "Okay." I was impressed that the resident had even taken that step to check because transilluminating is kind of sophisticated and folks don't always do it. I told the resident that it was good that he'd checked and probed to see if there was other compelling evidence to support a sinus infection. "She has facial pain and has been coughing up green phlegm for nearly three weeks. And decongestants haven't helped," my resident answered. A few moments later, I overhear Lorenzo D. talking to a different resident about a nearly identical patient presentation. This actually isn't unusual--most physicians will tell you that conditions often come to the office in groups. Today seemed to be "sinus day." Anyways. 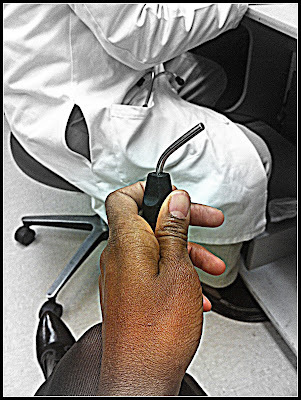 I hear Lorenzo D. spitting all kinds of sinusoidal pearls to this resident followed by him explaining that "unless you look with a transilluminator--you know the special attachment made for this--you might think a patient has sinusitis who doesn't." That resident nodded in acknowledgment. I decided to poke my regular fun at my friend--especially because I was hoping to rope his brainy goodness into the patient I was discussing at the same time. "And I'd be willing to bet that you have a transilluminator somewhere in your bag." Because seriously? This is the kind of thing that a medicine nerd of this proportion would totally have. At this point all of the residents looked over at him to see what he'd do. From the quick flush that came over his face, I knew I was right. I laughed out loud and so did he. He reached right into that bag and confirmed exactly what I'd suggested. "I love working with such a medicine nerd!" I clapped my hands and reached for that little needle-nosed light-shiner from his hand. "You are like my most favorite medicine nerd in all of Grady-dom!" And I meant that because I was deeply impressed by the fact that he did indeed have this special device that I had not seen since my third year of medical school. Why? Because he knew he could achieve a more accurate examination if he had it. Then he explained to all of us that the focused light emitted by this attachment (when replaced on the otoscope base) makes all of the difference. Next came a few percentages and teaching points to boot. As always, on this day my fellow medicine nerd Lorenzo D. didn't disappoint. This time, it was in the form of some obscure piece of medical equipment. And yes. Having a transilluminator attachment thingie on your person makes you a bona fide, full-fledged, top-tiered medicine nerd beyond any shadow of a doubt. But it also means that you care. A whole, whole lot. Which, if you ask me, is really, really great. "Let it shine, let it shine, let it shine. . . ."
Happy Sunday. Oh, and set your clocks back. Oh. Now I'm thinking that everyone should have one of those transilluminators. Elizabeth, that's just what I was thinking! Interesting. As the owner of approximately 8,000 plus sinus infections over my lifetime, my ENT has never trans-illuminated me. He always x-rays my head instead. I'll have to ask him about this. I always learn something here, which is one of the many reasons I love this blog so much and read it daily. Thanks!